It was June of 1978, it had a proposed title of Space Monster, and it involved shooting enemy tanks. It was the George Lucas epic Star Wars that induced a 'space boom' that raged throughout Japan, influencing Nishikado (the games designer) to change from tanks to space aliens. Upon the games release, the Taito Sales department proposed a name change to Space Invaders, which went on to become one of the worlds most recognizable video game names. Space Invaders earned a place in the 2008 Guinness World Records as the top-rated arcade game in technical, creative and cultural impact. 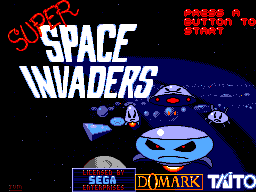 Many variations of the original arcade version have been created for a multitude of platforms, which includes Domark's Super Space Invaders for the Sega Master System in 1991. Super Space Invaders follows the same idea as its original; you are a lonely ship, facing armies of alien enemies who in waves, with enemies getting progressively faster and closer to landing as their numbers deplete. The ship itself cannot move up and down, the player is fixed to moving left and right to avoid enemy fire and collect extra weapons. 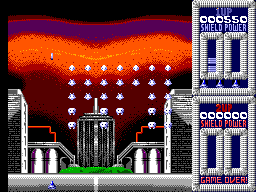 After playing the same level a couple of times, enemy movements become predictable, which helps when the player is on boss levels. A piece of advice would be to go for the extra weapons as you can receive some considerably helpful extras. To use the extra just hit button 2. The initial menu allows the player to select a one or two player game, the two player option allows two people to control individual ships on one game screen. I found the bonus levels fun, especially saving the cattle from an army of incoming UFO's. 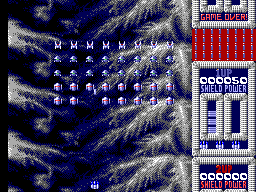 With the original version released in 1978, it would be expected that a following version like Super Space Invaders would have similar basic graphics. Domark have concentrated on the right areas, providing a range of different and colorful backgrounds and enemies who are noticeably different looking. During menu screens and while the game is sitting idle showing the credits, game music builds up to an impressive digital tune. The game captivates you enough to not notice the lack of in-game music, instead the players ears is provided with a range of sound effects that complement the shooting and destroying of enemies, extra weapon planes, and collecting and using extra weapons. The sound effects, while not outstanding are sufficient. There is not a lot to them, left, right, shoot and use special weapon. The game is all about timing, more-so when you have fewer enemies on the screen. Look for extra weapons, some allow for faster shooting which can be a lifesaver. Each play gives you three lives and two continues. You do not lose your score when you continue, although you will start at the beginning of a level, which is frustrating when your lives have been taken by a difficult boss. This gives the player a fair chance at progressing through the game. The range of different backgrounds, enemies and bosses gives this game huge reply value. The special levels can break up the monotony of having waves of enemies attacking. After replaying this game several times, the player becomes accustomed to the different movements of different enemies, and different strategies can be employed on various levels. Boss levels are much the same, once the player has learnt the enemy's movement pattern, they become easier to kill and thus progress to a new and exciting level. When replying, the player can select normal game mode, which allows them to choose the next level, adding to the game's replay value. In the movie industry, sequels and remakes usually a disaster. Domark has taken a much loved, iconic game from the late 70s and given it a refreshing new 90s look while keeping the core game the same. Domark has harnessed the Master Systems 8 bit power in providing bright, colorful levels with great menu music. The special levels and 2 player modes provide fun added bonuses. With a relatively simple concept of moving a spaceship left and right while shooting enemies anyone can pick this game up, although that does not mean its easy. It takes a truly dedicated player to learn each level, time each shot, learn the movements on each boss and ultimately save the world from 36 waves of enemies over 12 teeth grinding, controller throwing, screen abusing levels.